Seven “zones” have been dedicated for family-oriented fun, Phuket Vice Governor Snith Sriwihok told leading officials at a meeting at the Department of Disaster Prevention and Mitigation Phuket office (DDPM-Phuket) in Phuket Town on Tuesday (April 4). This year the zones are at: Bangla Rd and Loma Park in Patong; Saphan Hin and in front of Limelight Avenue mall in Phuket Town; Soi Ta-iad in Chalong; along the Kata Beach road; and at Surin Beach in Cherng Talay. “The Songkran water splash zones will be helpful for people who want to enjoy the ‘water play’ and there will be officials to take care of them,” V/Gov Snith said. However, many of the zones will still allow traffic through to engage in the “water play”, V/Gov Snith noted. “Only Bangla Rd will be closed to traffic so people can enjoy the festival, as tourists there start splashing water to celebrate Songkran in the afternoon of April 12 and continue through April 13,” he said. “This year there are no strict rules for Songkran, but like every year people joining the water play are asked play softly. For example, there is to be no ice throwing and no coloured powder added in the water,” V/Gov Snith added. At the time of this article going to press, whether alcohol will be allowed to be sold or consumed in the zones remained unclear. Some zones, such as the one at Limelight Avenue mall in Phuket Town, are opening promoting the zone as “No Alcohol”, while traditionally at some other zones, such as Bangla Rd in Patong, alcohol has been tolerated. 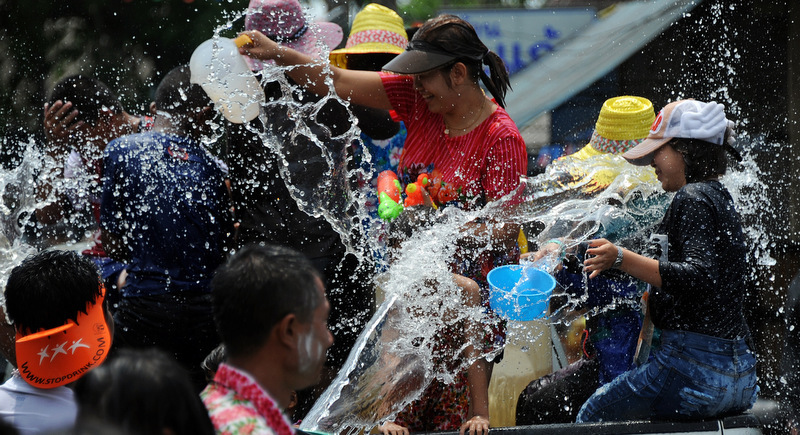 As announced by Deputy Prime Minister General Prawit Wongsuwan said at the Defence Ministry in Bangkok on Monday, Songkran revellers have been given the nod to splash and spray water from the back of pickup trucks – provided they do it on secondary roads or residential streets and not busy thoroughfares. Deputy PM Gen Prawit said that the traditional festive activity could be carried out on minor roads, where imposing speed limits and supervising motorists would be easier. However, main roads and highways where motorists travel at speed have been ruled out of bounds for water activities. “To prevent road accidents we will focus on risky areas where there have been a lot of accidents, such as the road over Patong Hill and the main points where traffic is dense,” V/Gov Snith said. “The government policy allows people in the back of pickup trucks, but if there are too many people or they are behaving dangerously, law enforcement will be strict and those who break the law will be charged,” V/Gov Snith warned.